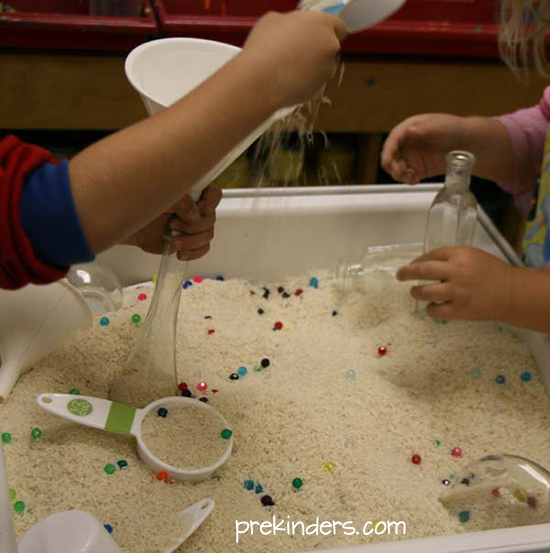 Here are some ideas and pictures of my Preschool Sensory Table activities. Children mixed primary-colored water to make secondary colors. The bucket in the middle was for dumping the water when finished, or to start over. Children mixed cornstarch with colored water to make “goop”. Children added liquid soap to water with medicine droppers and blew bubbles with a straw. Children poured water into different sized containers. Children poured sand into different sized containers. I use dustless Jurassic Sand — see resources section below for info. 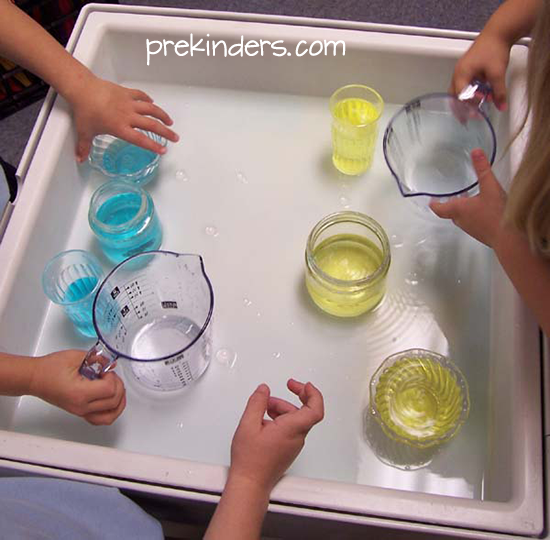 Children explored crushed ice and colored water by adding drops of colored water to a cup of ice. Children used a spoon to move cocoa from the bowl on the left to the right. The cocoa gives off a nice scent. Cinnamon and other spices can also be used. Children used Jurassic Sand with Tree Blocks, river rocks, and plastic lizards for creative play. Children used Jurassic Sand with Tree Blocks and plastic spiders for creative play. The plastic spiders are spider rings with the ring part cut off. Children used dry rice and colored jewels with measuring cups, funnels, and different sizes and shapes of clear glass containers. Children used water and colored jewels with measuring cups, funnels, and different sizes and shapes of clear glass containers. Insta-Snow is a superabsorbant polymer. I let my kids watch as I make it so they can see the powder absorb the water. I bought mine at Hobby Lobby, but you can also get it from Steve Spangler. Since my kids don’t get the opportunity to see or touch real snow, they like to just run their fingers through it and play with it. You could also use it with measuring cups and containers of different sizes, or with small plastic polar animals. Place a cup of flour, cup of water, spoon, and bowl in the sensory table for each child (I only have room for two children at our table). The children can choose the amounts of flour and water to add to their bowl and stir, experimenting to see the different consistencies they get when they add more water or more flour. Jurassic Sand Website (Jurassic Sand has provided a discount code for PreKinders.com readers. Enter “PREKINDERS 10%” (with a space). I receive a lot of questions about where I purchased the sensory table. The truth is, I rescued it from my school’s storage building in pitiful condition, got rid of the bugs and frogs, soaped it down, and sprayed it with white spray paint (the kind made for plastic). Check educational supply catalogs to find similar sensory tables. Community Playthings has a nice one. Don’t miss the science resource page! These are wonderful ideas, it really inspired me! LOVE your ideas, all in spot I can use. It is just the boost I need after Teaching for many years. I love all your ideas! Did you make the tree blocks or did you buy them somewhere? They are the perfect size for using in a sensory bin and my K Prep kids would love them! Do you change out your table daily, weekly, monthly? I typically keep the sensory table the same for 2-3 weeks, possibly even a month. It all depends on the children’s interests. When their interest wanes, it’s time to change. What aisle at Hobby Lobby did you find the instant snow? I looked last time I was there and couldn’t find it. Was it on the science aisle or somewhere else? I hope that one day I can make my classroom half as amazing as your classroom is. Thank you for sharing your ideas! Do you know what kind of sensory table you have? The size and shape would be a great fit for my classroom. Thank you, Olivia. I really don’t know where the sensory table came from or what brand it is because I found it in really bad condition in a storage building and cleaned it up. I spray painted it with white Fusion spray paint for plastic because it looked so bad. I currently have a sensory table of the same size that came from Community Playthings. Your sensory table looks like this one from Discount School Supply. Where did you find the little white trays with 6 slots? It is pictured in the color mixing activity with the bucket in the middle for dumping. Those little trays come from places like Michaels or Hobby Lobby in the area where they sell paints and canvases. They are paint trays. The creative exploration (lizards) is a great idea. Where did you get the tree blocks? Do you have a scheduled rotation for the sensory table? Also, do you have an assistant stand and monitor the table each day? No, I don’t have a schedule. I do put a list on the wall with all kids names and when they go, I put a check by their name. That way, if I have kids begging to go and there’s a child who has already been there, I can show them that we need to give everyone a turn. Most of the time, there’s no problem, even though I have 22 students. The kids work it out on their own. I don’t regulate who goes there or when at all unless a child comes to me saying they need a turn. If you meant a rotation of what’s in the sensory table, I just go with the children’s interests. No schedule for that either, but most sensory tables are there for 2-3 weeks. No, I don’t have an assistant monitor the table. We talk about rules and if they don’t follow them they have to leave, but we don’t monitor it. Thank you for the opportunity to print such wonderful activity ideas. Thank you from a preschool teacher. I love all the ideas you share with all of us. Thank you for all the wonderful ideas. Thank you for giving me the opportunity of printing such amazing ideas. I love all of these… and have a big question too :). Where did you get that table?? The table in the photos is a very, very old one that I got out of my school’s storage. I had to do some major clean up on it, and I spray painted it with plastic spray paint to make it look “new”. Check with Community Playthings — the sensory table I have now at my current school is from there and I love it.